I love coral and coral bedroom furniture looks great with white bedding. 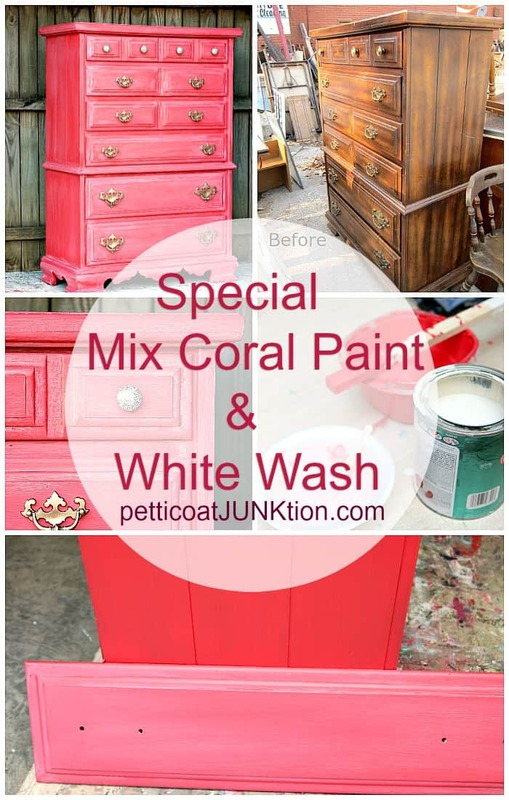 Did you know you can mix red paint with yellow paint to create a pretty coral color? It’s true. 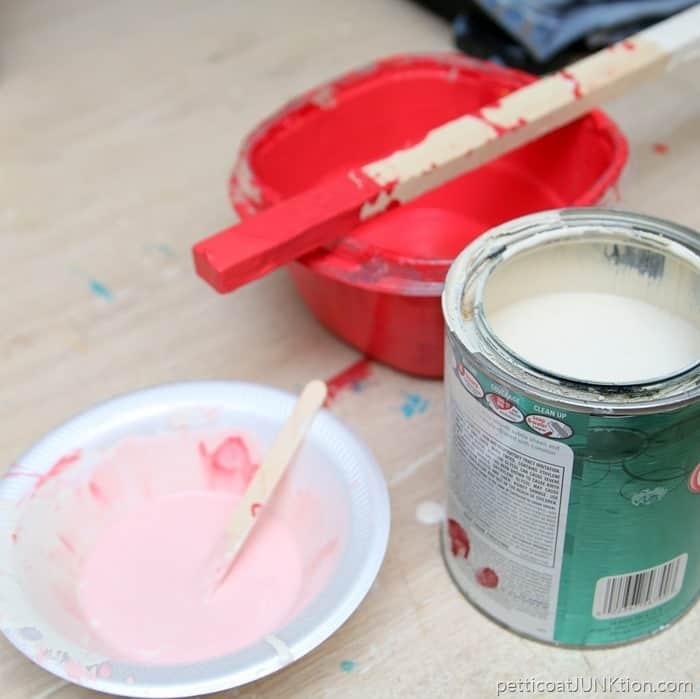 For the project today I didn’t have coral paint on hand so I Googled how to mix colors to make coral paint. 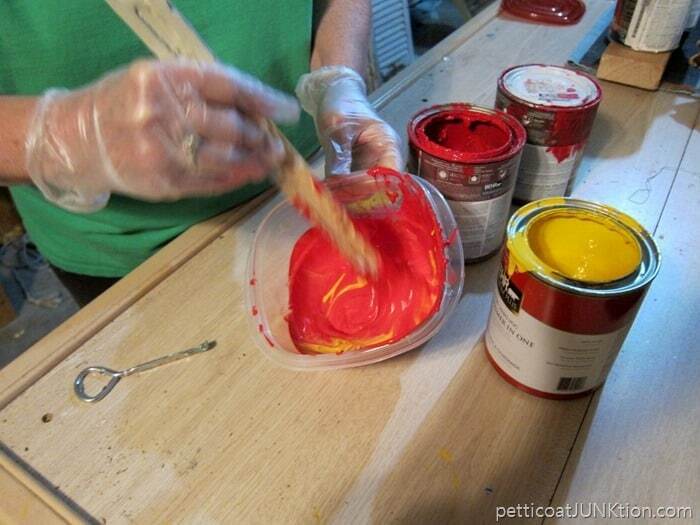 Red and yellow make coral and the shade of coral depends on how much of each color you use in the mix. I’m giving you all the details on this makeover and there are a ton of pictures. 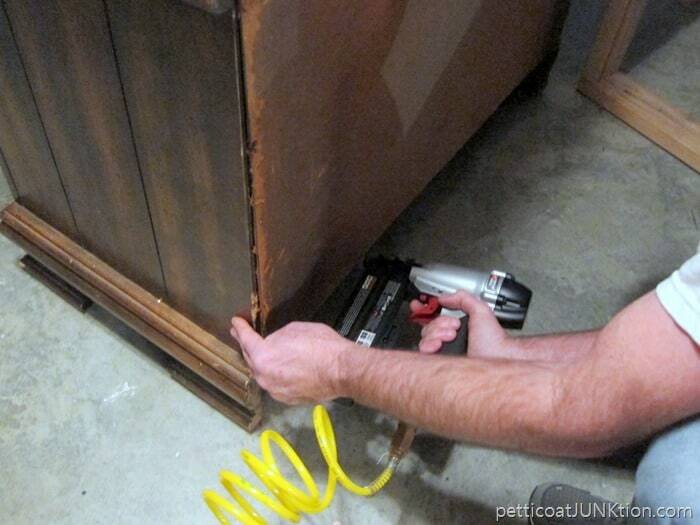 My five fellow Furniture Fixer Uppers have some awesome projects to share today too. The links are at the bottom of the post. 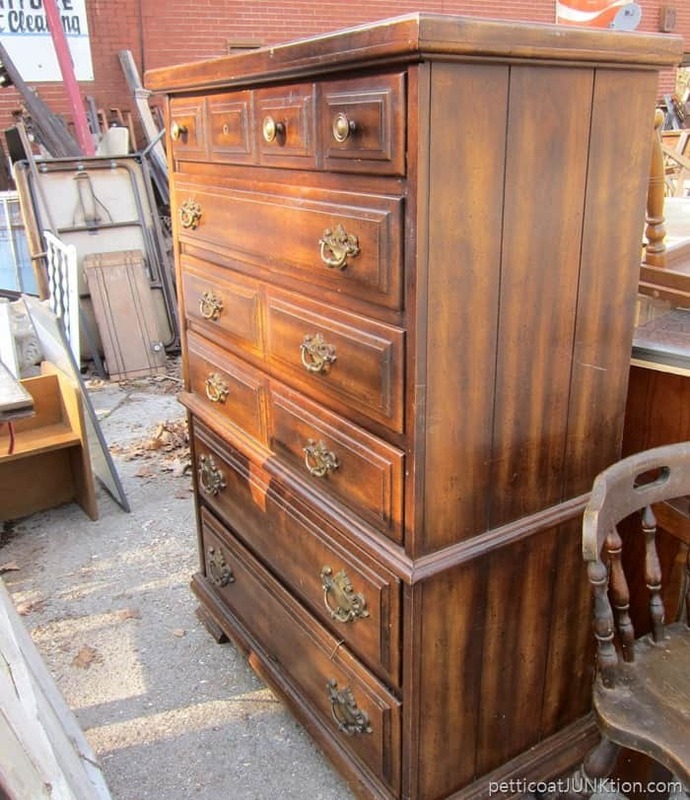 I purchased the chest of drawers at the junk shop…you know, my favorite one. It was only $15 but there was a reason for that. The side molding was off and there was no drawer in the bottom spot, just a drawer front. The JTS (aka Junktion Technical Specialist, aka hubby) used a nail gun to re-adhere the back to the chest and the molding to the side. 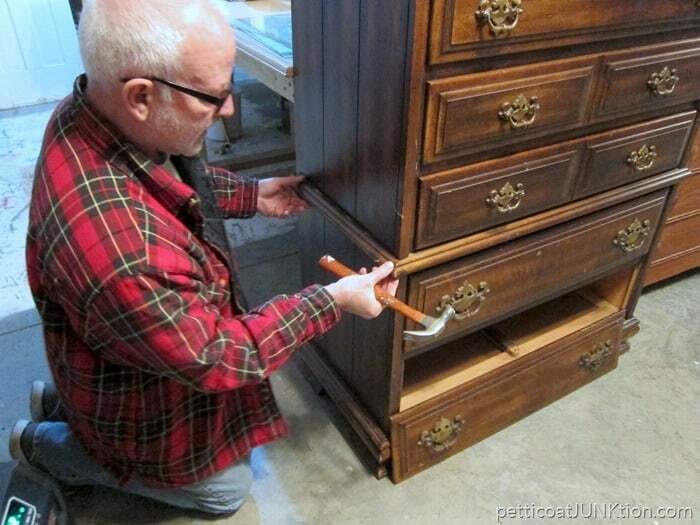 Then he nailed the drawer front to the chest. We decided that would be much easier than trying to build a drawer. A shelf at the bottom of the chest didn’t make sense either. The chest is really tall and has 5 drawers minus the bottom one so that’s plenty of drawers. Now for the funny story about the drawer front. 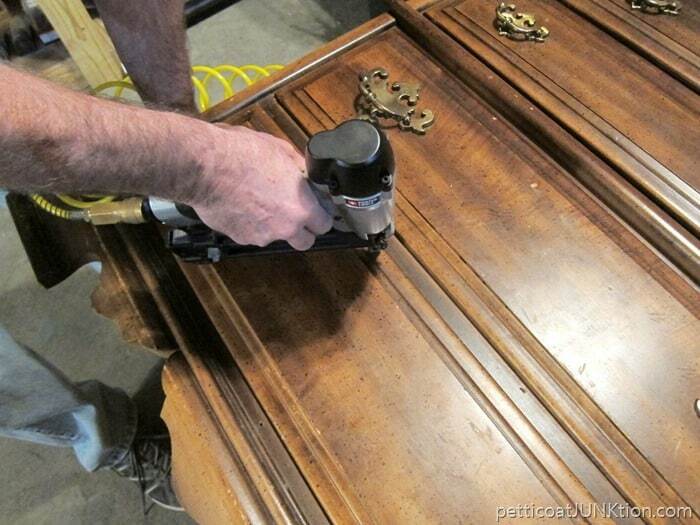 While in the process of removing the drawer pulls in preparation for painting the chest I realized we couldn’t remove the pulls from the drawer front we just nailed on. Taking one step back we removed the drawer front and nailed it back on after the painting was finished. The runners were flopping around everywhere. We used Elmer’s Glue to glue the blocks and the runners back in place. 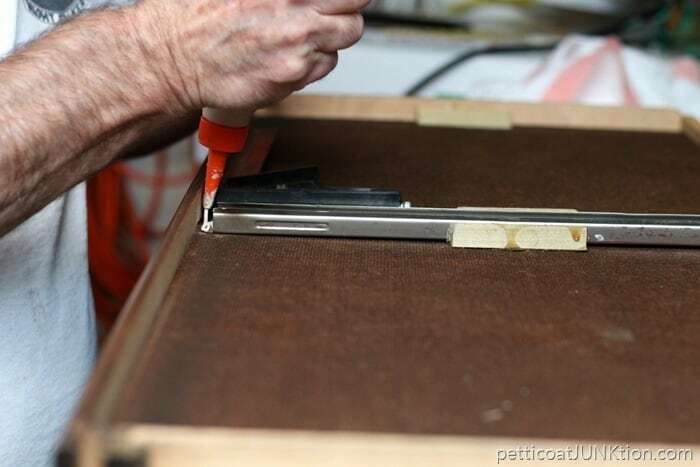 Before painting I always cover the hardware screw holes with FrogTape to prevent paint from leaking into the drawer. 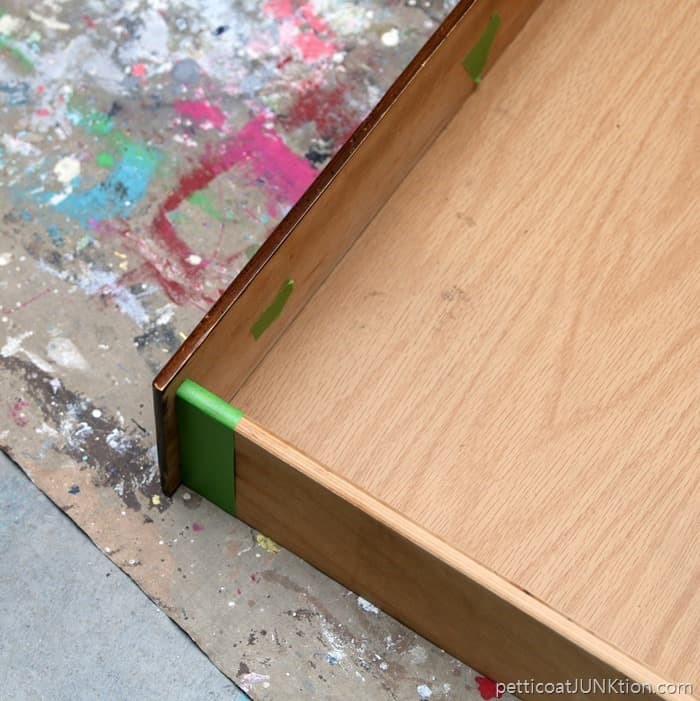 I also tape the sides of the drawers to make for a nicer looking paint job. Man, now I’m finally ready to paint. I started with Glidden Gripper Primer tinted gray. I’m trying to use paint in my stash instead of buying more. I’ve always loved mixing paint colors but this time it was a have-to. No coral paint. I mixed red and yellow paints to make coral. I started with red and added yellow until I got the shade I wanted. 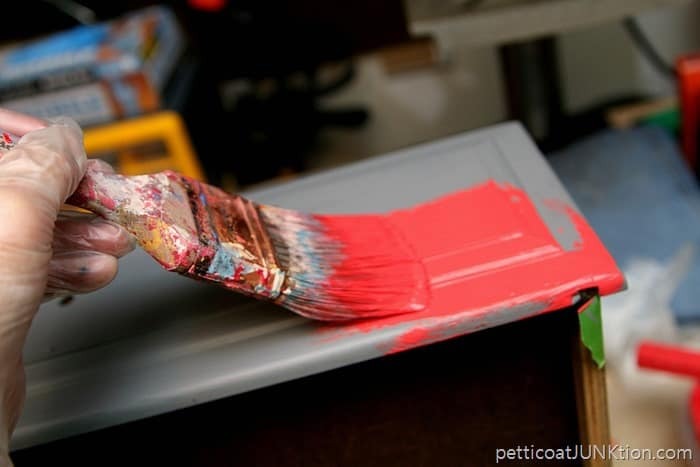 When mixing your own paint colors just remember that paint dries darker than the color it is when wet. Next I mixed white paint with water to make a thin wash. I added just a bit of the coral paint color to the mix. 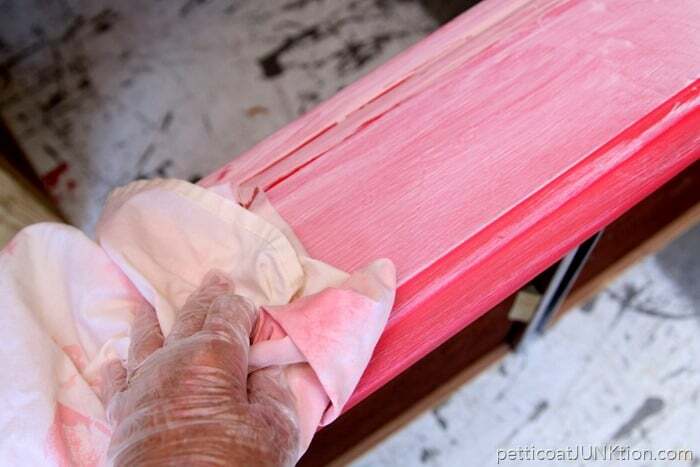 I dipped a lint free rag (old sheet) into the paint wash and rubbed it over the drawer front. This leaves a heavy coat of wash on the finish. I wiped the wash off with a slightly damp cloth until I achieved the effect I was going after. 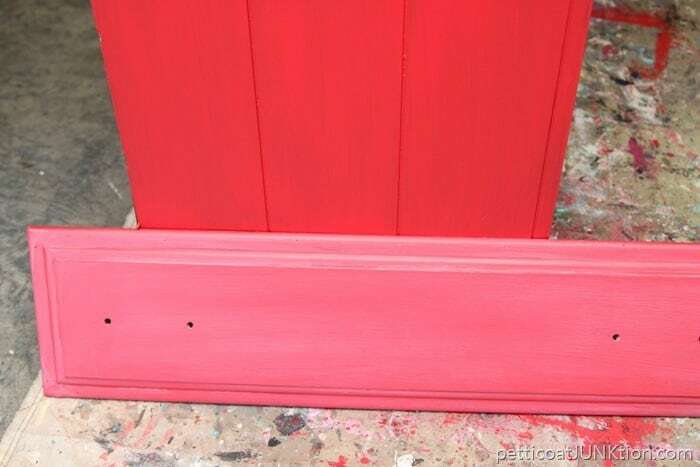 The photo above shows the body of the chest painted coral and the drawer front painted coral with the wash. A big difference in the finishes. You will not be able to achieve a perfectly matching finish all over. I guarantee you will drive yourself nuts if you try. Perfectly imperfect is the best. 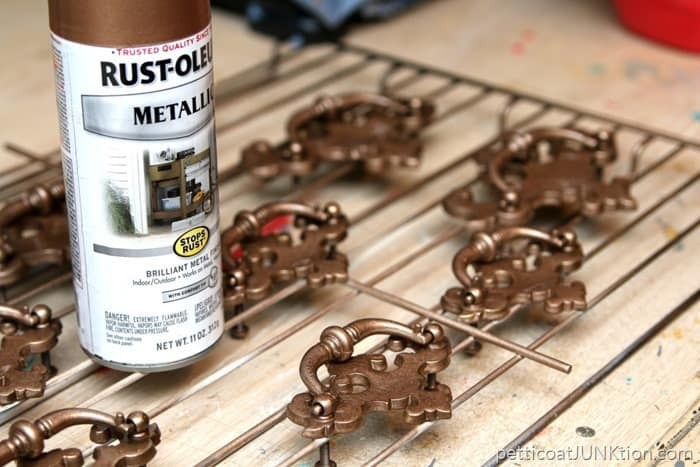 The last step was to spray paint the original hardware with Rustoleum Rose Gold Metallic Spray Paint (Amazon affiliate link). One of the four pulls on the top drawer was missing. I just happened to have four classy metallic gold and white pulls from Hobby Lobby in my stash. Perfect. The rose gold metallic is a beautiful soft, almost flat gold. Very pretty. And that’s it for my project. What do you think? How do you like the coral color? Do you ever mix paints? 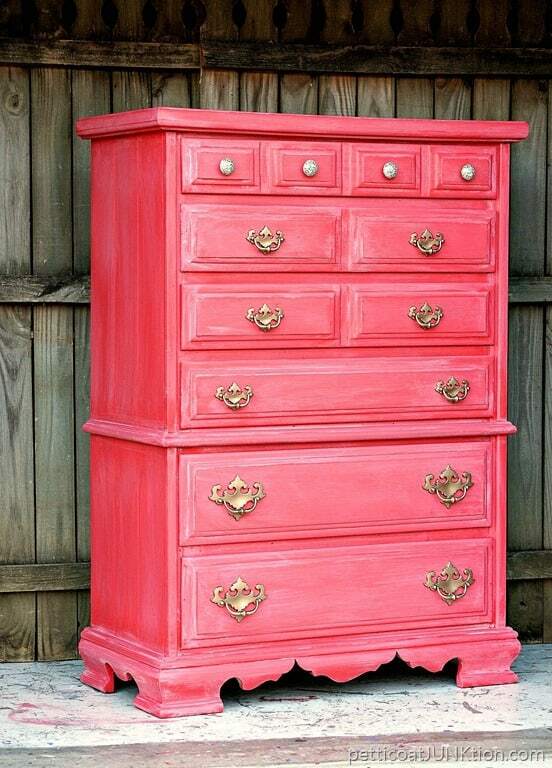 And you must see the pretty nursery piece I painted coral/pink here….. Coral Nursery Dresser. 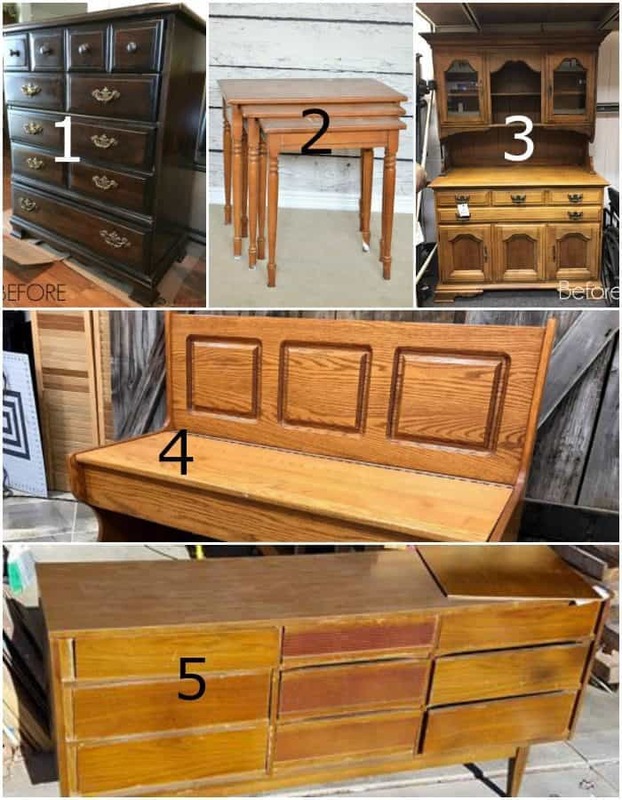 Be sure and check out the projects from my fellow Furniture Fixer Uppers by clicking the pink text links below the “before” photos. This project turned out perfectly! 🙂 I had no idea the colors used to make this pretty color of coral! One of your best transformations! 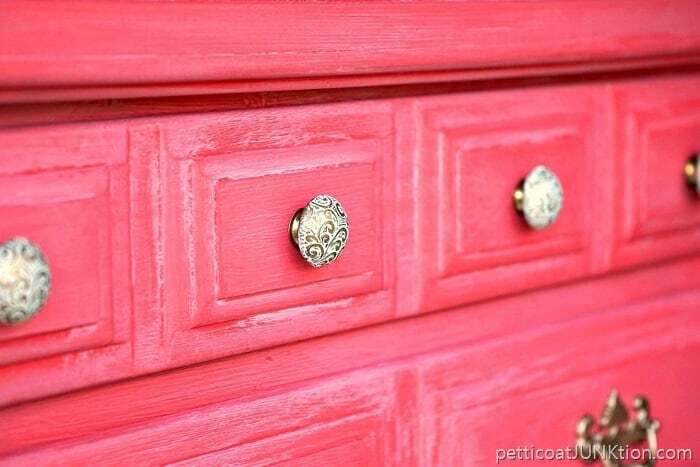 What a great idea to mix the paint to make a custom color! I love how the coral turned out. PS…I have almost that exact same dresser in my guest bedroom that I inherited from my parents. I might have to break out the paint on it! 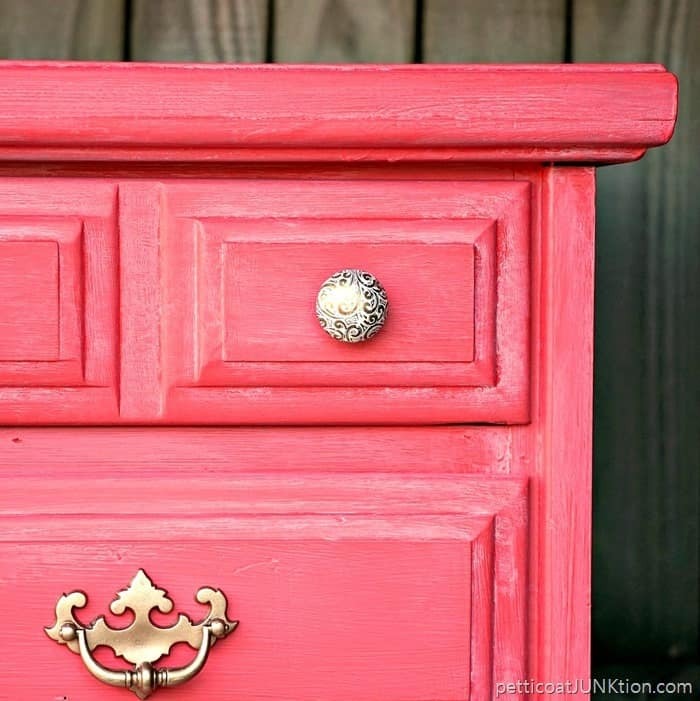 You did a great job with this bold furniture makeover. 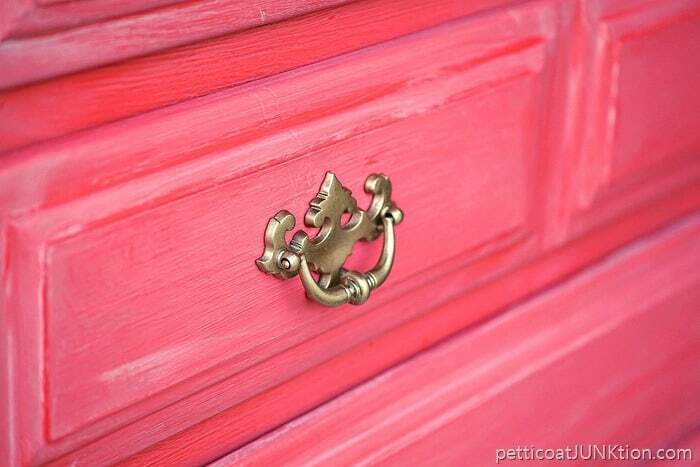 The special mixed color and the hardware complement each other perfectly. Thanks for also including a tutorial about making repairs to the piece before you painted. It’s good information to have for future reference. Pinning. Nothing feels better than giving new life to an old piece and either selling it or putting it in your home for that dash of unique personality. PLUS, when you can decorate and get that wow factor for little or no $$$, well, that’s even better. Love this color. Coral is my absolute fave. Vising via Denise Designed Linky party. So glad I stopped by. Having a piece of furniture that bright in my house would be eye-stopping! I tend to gravitate toward the more understated colors. But I do like the way the dresser turned out. I certainly like it better with the wash than without. I love the hardware color. It is really complimentary to the coral color. I haven’t mixed paint that much. It looks fun, though. I do mix my nail polish colors all the time! Does that count?? Kathy that is such a beautiful color. And the wash makes it all the more so. 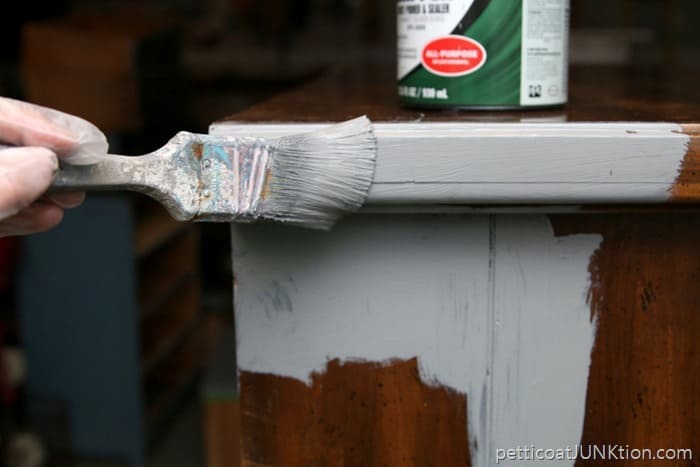 Oh my gosh, Kathy I am swooning over that paint color and whitewash finish. Those pretty metallic knobs are the jewelry that pulled it all together. Stunning makeover! I love the color and the white wash. It is really beautiful! I’m not familiar with the gray grip primer I think k I will have to check it out. What a refreshing makeover, Kathy! I love the color you created and the gold really sets it off. Beautiful!